Kensington, Brooklyn: Coffee on Ditmas! 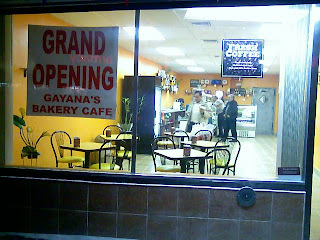 On my way home last night from the Ditmas Ave F train stop, I noticed a new coffee shop on Ditmas. I didn't catch the exact streets, but it's on the short walk between the subway and Ocean Parkway on Ditmas Ave, on the south side of the street. The awning is orange. It's pretty shiny and bright and clean inside plus they have pastries, cookies, coffee, and SEATS!